The Winecup Gamble Ranch is located in the northeast corner of Nevada. 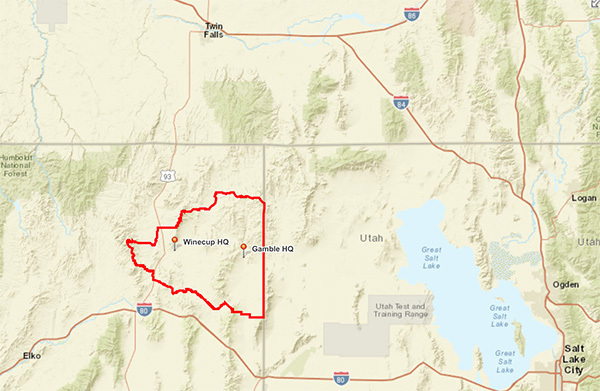 The sheer magnitude of the ranch, at nearly one million acres, can be seen in its size at roughly 58 miles from east to west and 32 miles from north to south. The ranch’s borders are situated approximately 1.5 hours south of Twin Falls, Idaho and 2.5 hours west of Salt Lake City, Utah. The elevation and erratic terrain of the Winecup Gamble Ranch landscape varies from 4700 feet at the valley floor to over 8400 feet on surrounding mountaintops, making this area of northeastern Nevada a topographic tapestry of geologic and environmental diversity. Rugged rock formations, windblown slopes dotted with pinion pine, juniper, and aspen offer stunning views in the high country, while numerous riparian areas in the valleys serve as important wildlife habitat. From the landscape we manage, to our economic viability, to our community, the Winecup Gamble Ranch strives for excellence in all that we do. Our ranch remains committed to tradition while embracing new philosophies through the use of holistic management principles and regenerative grazing practices.